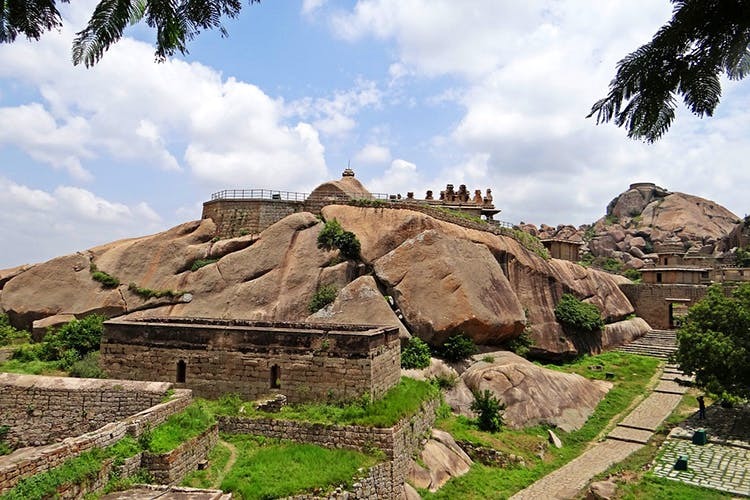 Chitradurga and its surroundings come packed with history, trekking trails and pretty sights. It’s perfect for a day away from good old Bangalore! Looking for new lands to explore during your next weekend trip? Well, Chitradurga, a three-hour ride from the city, might just be the sight your sore eyes need. The historical district sits pretty amidst the valley of River Vedvati and offers a plethora of activities including trekking and water sports. Chitradurga gets its name from, well, the Chitradurga Fort that’s the district’s most famous sight. Spread across hills and valleys, the fort is said to have been built between the 11th and 13th centuries. And you can spend your time here gawking at the graceful temples, inscriptions and carvings. Once you’ve wrapped up here, take a short ride to the Chandravalli Caves. Archaeologists have discovered gems like ancient earthenware and coins from the Augustus Caesar era here. At the entrance, you can hire a guide to take you through the dark chambers and uncover their many secrets. The surrounding lake and rocky landscape make for a picturesque sight as well! For those of you looking to pack in a workout during your day of fun, then, the Joggi Matti forest reserve is an excellent place for a trek. Do note that you need permission from the local forest department to trek here so make sure you have that in your kitty before setting out. At the reserve, you can make your way through dirt trails surrounded by greenery and stop to take in the sounds of the birds and the bees. You can also get your adrenaline pumping at the Vani Vilasa Dam, the oldest in the State. Set against the backdrop of hills, the dam attracts adventure seekers who come by to take cruise the waters on jet skis, canoes and banana boats.